For 2018 paint color trends, some paint companies have opted for bold and strong colors as their 2018 Color of the Year. I recently blogged about the Nautical Greens and Blues as Colors of the Year chosen by some paint companies, but there is a whole other rainbow of colors out there too! These include spicy red and jeweled purple, and even deep black. Nobody is expected to redecorate just to incorporate the annual Colors of the Year, but it’s good to see the new color picks and think about how they might enliven our own decor, even just in accents and details. 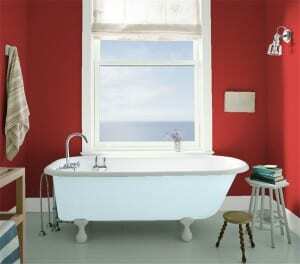 Benjamin Moore’s Color of the Year, Caliente AF-290, is a strong and radiant red that provides an injection of energy. 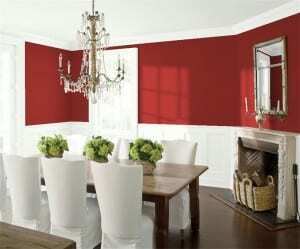 Red is a traditional color for a dining room as it is said to stimulate appetite. The color also gives a sense of warmth and drama to this bathroom. We can imagine Caliente working beautifully in a traditional home, but it would also look clean and strong in a contemporary interior design scheme too. 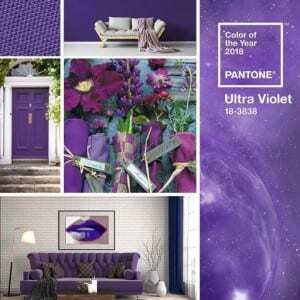 Pantone has gone purple crazy with its 2018 Color of the Year: Ultra Violet. In interiors, this expressive color can create an Old World intense cocoon mood if used on multiple walls, or it can conjure up a romantic Boho feel. In a modern interior it could look dramatic and a little bit edgy. It will certainly draw attention to itself, whether used as a wall color or as an accent in furniture or throw cushions and drapes. 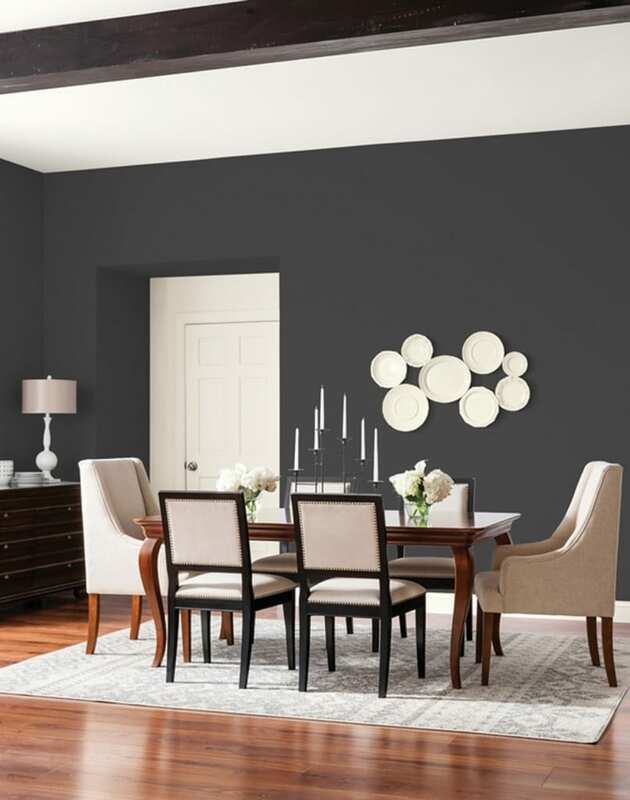 Glidden opted for the dark charcoal grey tone called Deep Onyx as its Color of the Year. The color looks crisp and clean in a modern setting, especially paired with white. But, as with the Ultra Violet color, we can also see it as a great choice for a traditional home that wants to evoke an Old World feel. Picture it creating a slightly Dickensian London look in a library or masculine home office! It is a good idea to hang sizeable art or other decorative elements on the walls to punctuate the Deep Onyx color, otherwise too large an expanse of black could look heavy. The dining room above does a great job with the white plates hanging on the wall. In a traditional room you could hang gilt framed artwork. What do you think of these bold and strong colors? Do you have colors like this in your home? We’d love to see photos! This entry was posted in Home Design Ideas and tagged color palette, color trends, creative home decorating, decorating with black, decorating with red, design inspiration, interior decor, interior design, paint color, purple, red, red decorating, red design scheme, red interior, using red in rooms on April 7, 2018 by admin.